Wills Wing has developed a Vertical Stabilizer attachment for the purpose of helping hang glider pilots minimize or eliminate problems with roll / yaw oscillations. The tendency towards oscillations of this type is present to some degree in all high aspect ratio gliders, particularly when flying at faster speeds in turbulence, and when towing (especially aero-towing). Pilots with sufficient skill and experience can usually control or prevent such oscillations. Pilots who are making the transition from entry level gliders to high performance gliders, and pilots learning new skills such as aero-towing, are often unable to adequately prevent or recover from these oscillations. In the case of aero-towing, this can be enough of a problem to be a barrier to learning this new skill. 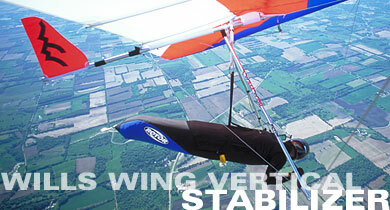 The Stabilizer is a great accessory for the advancing Beginner to Intermediate pilot. The stabilizer increases yaw stability and yaw damping, and as a result makes the glider substantially less susceptible to getting into oscillations, and makes it easier to recover from them. It also slows down the glider’s roll response slightly, and changes the roll / yaw coupling somewhat. The Stabilizer installs (and is removed and packed) easily (see Vertical Stabilizer Installation Instructions). It can be used on every flight, if desired. Alternately, the pilot can choose to use it only in some conditions, or only during the initial transition to a new glider, or trying a new skill, such as aero-towing. A pilot making the transition from a Falcon class glider to a higher performance, higher aspect ratio glider. In this case, the stabilizer provides an “intermediate configuration,” in terms of roll / yaw response, which eases the adjustment to what would otherwise be a more significant and difficult change in flight characteristics. A pilot learning how to aero-tow. In this case the stabilizer makes it much easier for the pilot to remain “on track” following the tug. Fly with the stabilizer in smooth air, until completely comfortable with all maneuvers, at all speeds, in that configuration. Gradually fly in more and more active air, with the stabilizer, until completely comfortable in the most active air in which you wish to fly. If desired, remove the stabilizer, and fly in smooth air, all speeds and maneuvers, until completely comfortable without the stabilizer. CAUTION: No vertical stabilizer should ever be attached in such a way that it is not oriented exactly vertically, and secured solidly against rotation. Gliders with removable rear keel sections must have those sections secured to the main keel with a through bolt or pin prior to mounting and using a stabilizer. Current production U2’s and Sport 2’s are made with a removeable rear keel stinger, secured to the keel with a clevis pin and safety. This stinger can simply be swapped out for a pre-drilled and bushed stinger (40B-4001 – STINGER 42MM U2/S2 BUSHED FOR STABILIZER) that will accept the stabilizer frame. If you are ordering a new U2 or Sport 2, and request a stabilizer ready keel at the time of order, we will ship the glider with the bushed stinger installed at no extra charge. A pilot who has a glider with the keel bushings already installed (all late-model Ultra Sports, for example) can buy just the 40S-1450 Stabilizer Assy (Frame and Cover Only) and fit it to his keel. 1.5 Sport American 167 HP II before 1988 HP 1 and earlier gliders. A pilot who wants to fit a stabilizer to multiple gliders may want to buy a number of 40S-1411, 12, 13, 14 Keel Extensions as appropriate. Stabilizer covers are available in all standard sailcloth colors, “WW” insignia (like wingtip) installed on left face unless otherwise requested. The Elbow Coupling is attached to the frame trailing edge piece, and would not normally be purchased separately.